You can play this game here! We have three things here, in the earlier post, we saw how chef was installed on the workstation. 1. Enterprise Chef Server - Which is the main server which will be orchestrating the entire process. 2. Node - this is the Virtual machine which will be hosting our app the one which will be carrying our payload. It will have the chef-client installed on it, which will be communicating with the Enterprise Chef server and controlling the configuration of the node or the VM. 3. Workstation - your laptop, that is the machine used to configure the Enterprise server and control the nodes. This is where we had installed chef in our earlier exercise. Before we get started we would need to get a login name and the starter kit from the Chef Enterprise Server. Go to this link and register. Remember that you will be using the organisation name, as we will be using it. 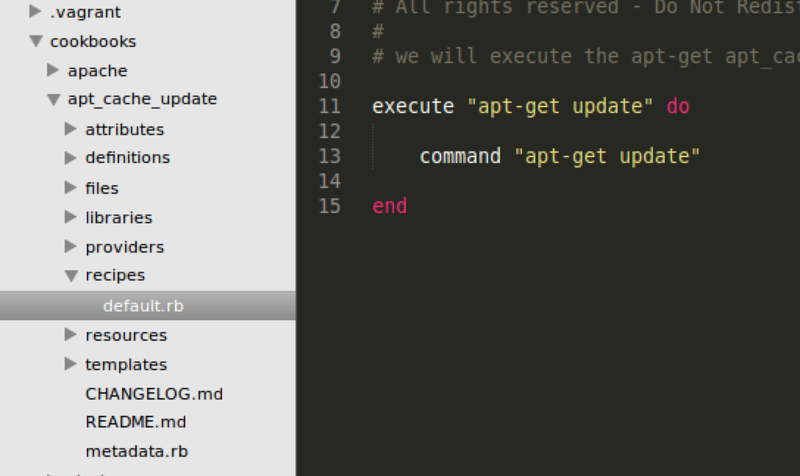 TIP: have sublimetext installed on your machine, so that its easier to edit the configuration files. You could use this link if you are on Ubuntu. to ensure that that knife is ready for us to use. and confirm the version number. gives us the organisation name confirming that your knife is connected. 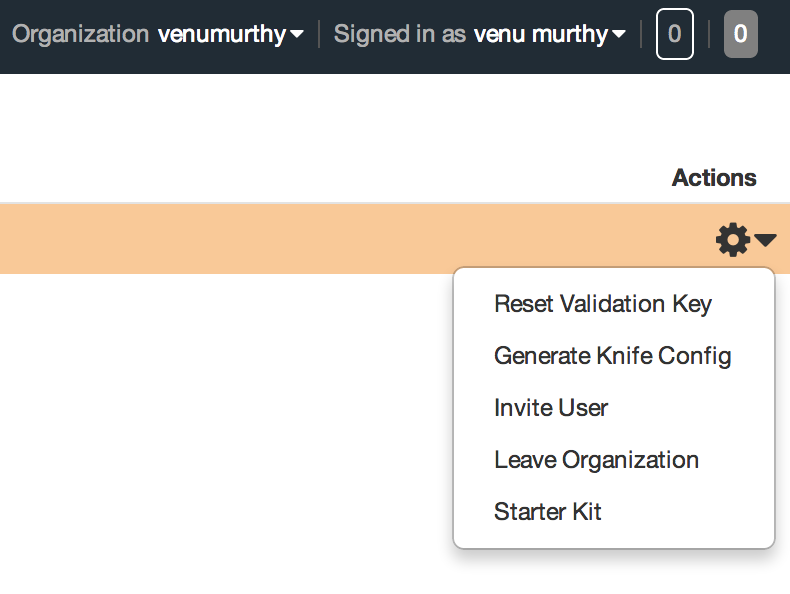 More information about Knife file configuration can be found on this link. 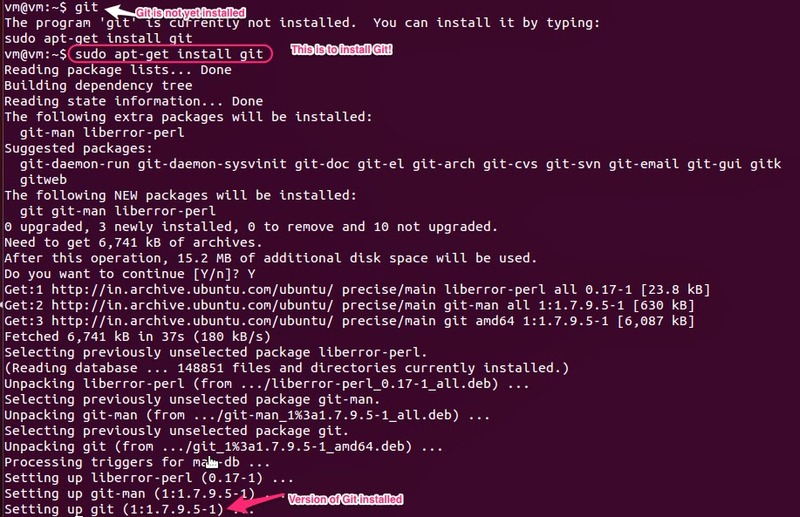 In the chef-repo, we initiate Git and then check in the code, you can refer this post to get a hang of Git. And we get the organisations by clicking on the Administration tab. and we can do the following from this page by clicking on the wrench on the right hand corner. Enough of setting things up now, time for some action! Getting a node or VM to try stuff out! We will use Vagrant, to create our nodes. To know more about Vagrant you can see some of the earlier post "Vagrant - Simplified and mastered!" and some more in this series. 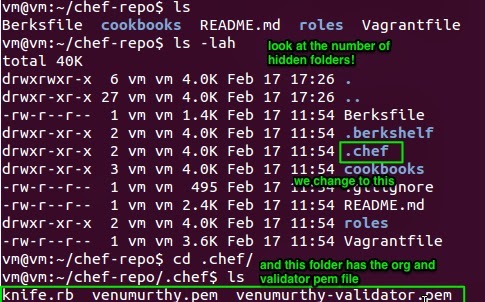 We see that within the chef-repo there is a Vagrantfile which is the config file to create a node or a VM. 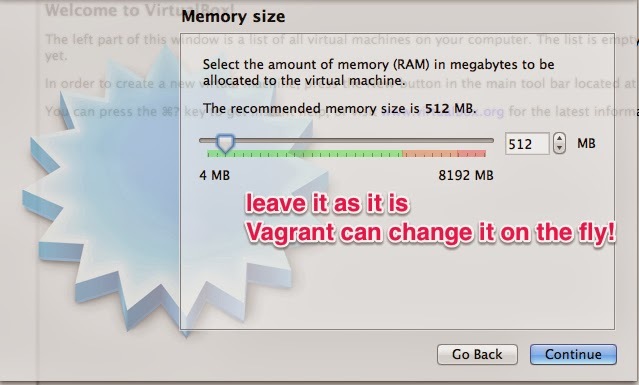 So we will just bring up a VM by using the "vagrant up" command. and we see on how to connect to it. Or even vagrant ssh comments also helps us in connecting to our instance. Is nothing but installing the chef-client on the node, there are two ways of doing it one of them is the attended and the other unattended. The default for this approach assumes that node can access the Chef website so that it may download the chef-client package from that location. The omnibus installer will detect the version of the operating system, and then install the appropriate version of the chef-client using a single command to install the chef-client and all of its dependencies, including an embedded version of Ruby, RubyGems, OpenSSL, key-value stores, parsers, libraries, and command line utilities. 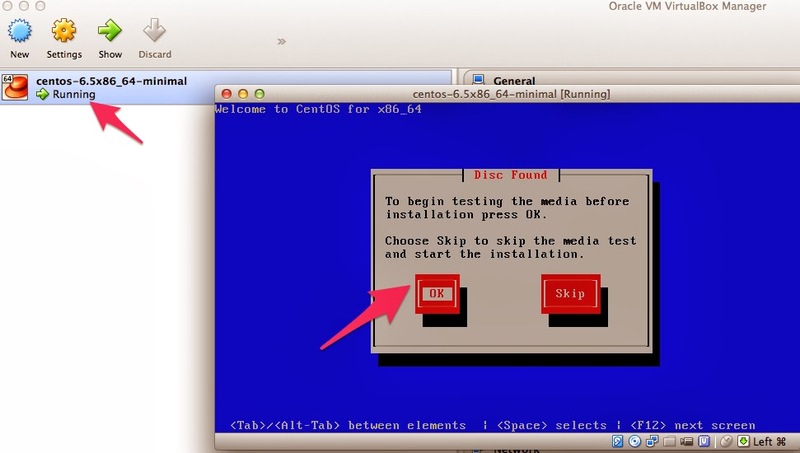 The omnibus installer puts everything into a unique directory (opt/opscode/) so that the chef-client will not interfere with other applications that may be running on the target machine. Once installed, the chef-client requires a few more configuration steps before it can perform its first chef-client run on a node. -N "nickname to refer to latter"
knife bootstrap 127.0.0.1 --sudo -x vagrant -P vagrant -p 22 -N "vm1"
its sheer joy to see it come up! this comes up when Vagrant is installed using apt-get. 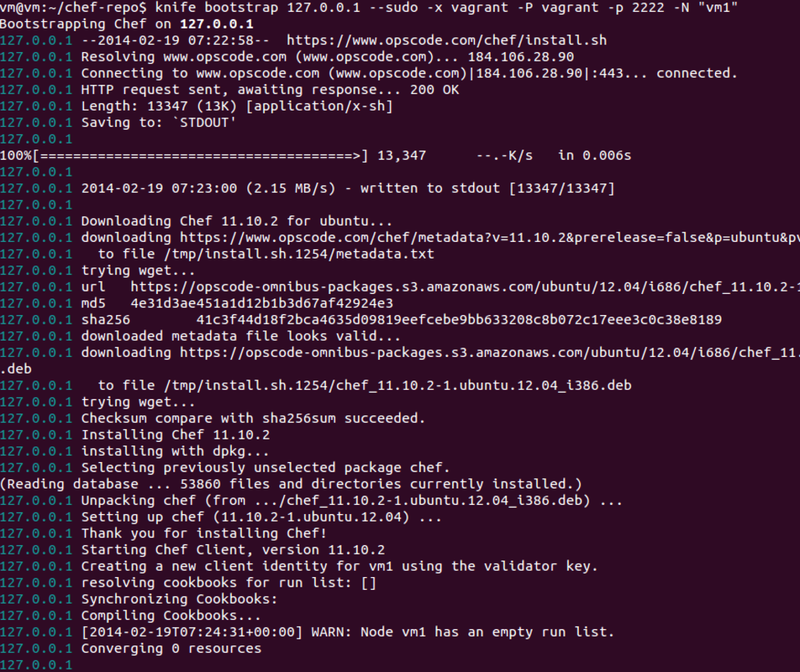 Hence download and install vagrant from the download page. Going back to the Chef Enterprise server console we see that this target has been added. We see the "vm1" added and below is the complete and detailed profile, which has come due to the system profiler called Ohai running on the node! we can run ohai on our machine and see the amount of details its throws up on the screen. A resource is a key part of a recipe. A resource defines the actions that can be taken, such as when a package should be installed, whether a service should be enabled or restarted, which groups, users, or groups of users should be created, where to put a collection of files, what the name of a new directory should be, and so on. Each resource is processed in the same order as they appear in a recipe. The chef-client ensures that the same actions are taken the same way everywhere and that actions produce the same result every time. 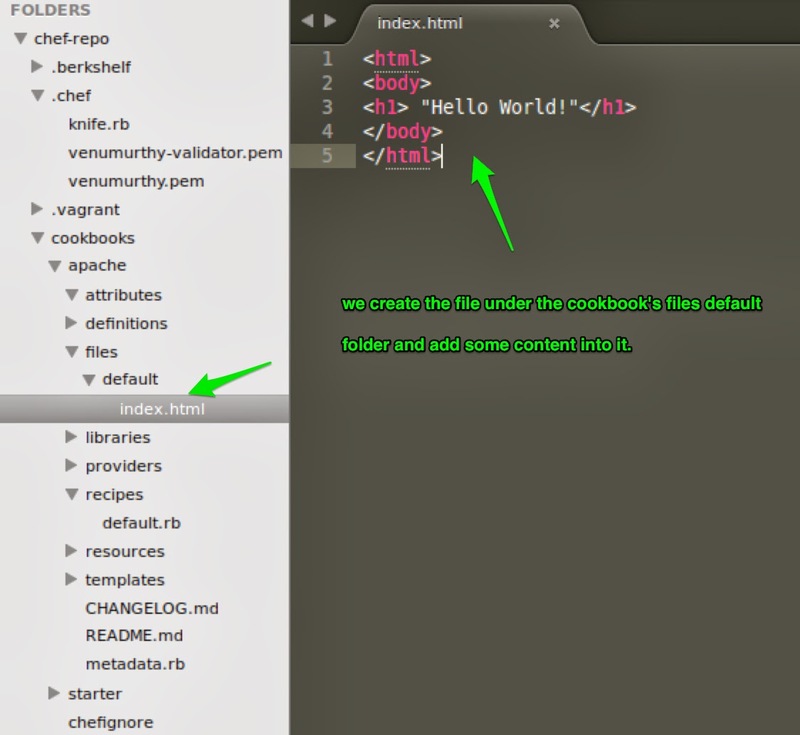 A resource is implemented within a recipe using Ruby. Where a resource represents a piece of the system (and its desired state), a provider defines the steps that are needed to bring that piece of the system from its current state into the desired state. These steps are de-coupled from the request itself. The request is made in a recipe and is defined by a lightweight resource. The steps are then defined by a lightweight provider. Every resource has its own set of actions and attribute. Most attributes have default values. Some attributes are available to all resources, for example some attributes are used to send notifications to other resources, whereas others are used to set up conditional execution rules. now that we want this service to be enabled even in reboot. The cookbook_file resource is used to transfer files from a sub-directory of the files/ directory in a cookbook to a specified path that is located on the host running the chef-client or chef-solo. 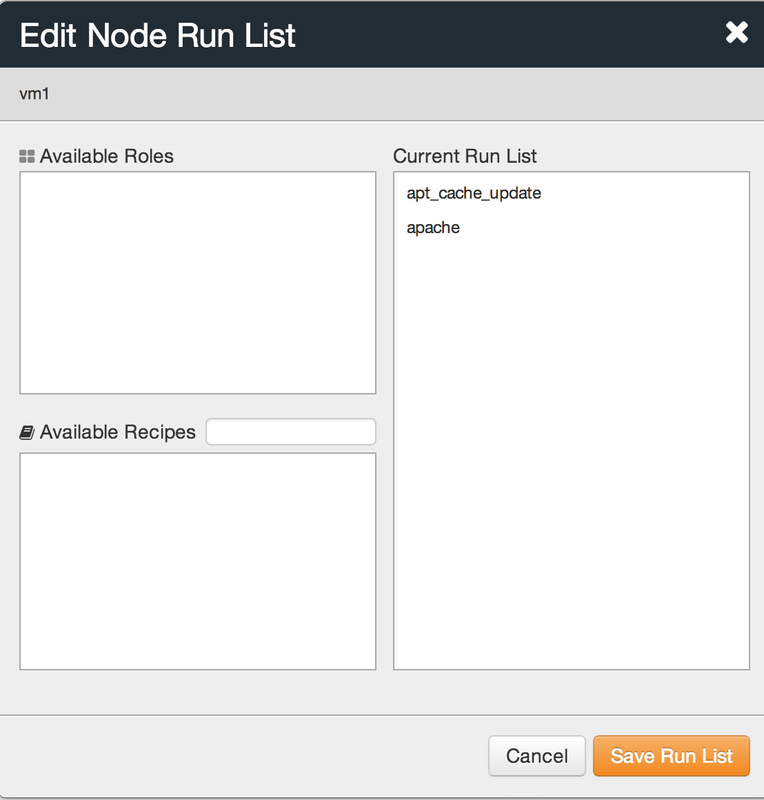 A run-list is an ordered list of recipes and/or roles that are run in an exact order. 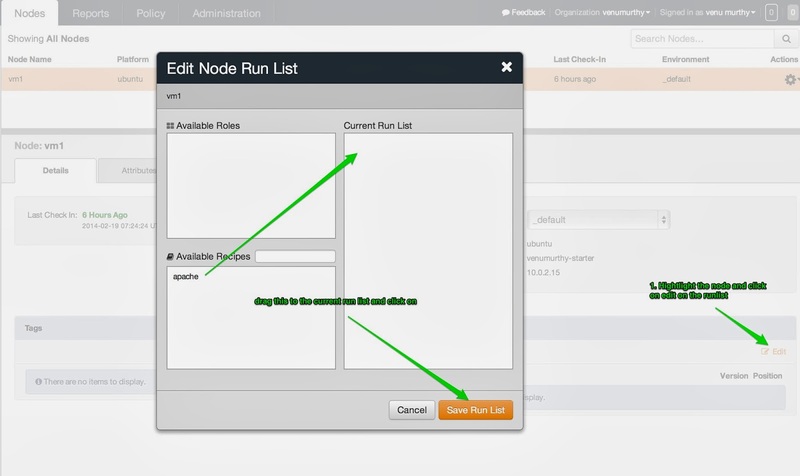 A run-list is always specific to the node on which it runs, though it is possible for many nodes to have run-lists that are similar or even identical. The items within a run-list are maintained using Knife and are uploaded to the server and stored as part of the node object for each node. The chef-client always configures a node in the exact order specified by its run-list and will never run the same recipe twice. A recipe is the most fundamental configuration element within the organization. So we see that a recipe in itself is of now use unless we've added it to the runlist. yes, it will give an error, as the apt-get cache is outdated and we would need to update it, but let's automate that, instead of having a manual process to do this and at the same time see how order matters in runlists. We will create one more recipe in a new cookbook for apt. 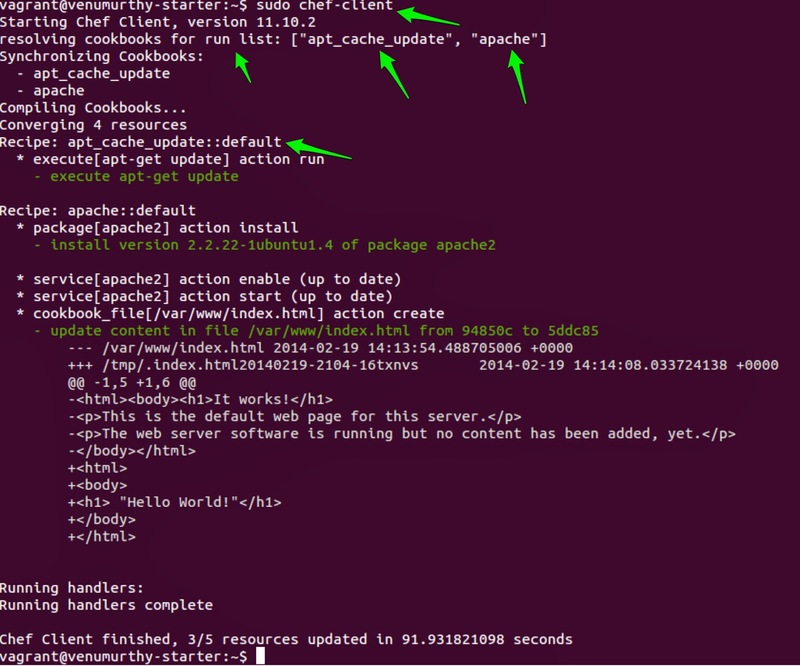 We create the cookbook called apt_cache_update, then add a recipe and upload it. and go into the Chef management console and add the newly created recipe and add it to being the first one in the order. save and now lets run the chef-client on the node to see what happens! and finally when we try to access use a browser to get this webpage on port 8080 we get the home page that we created! 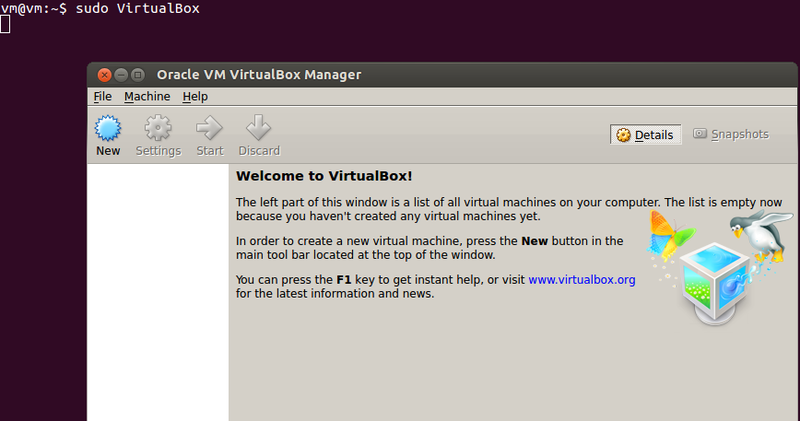 When working with VirutalBox it is quite helpful to have the VirtualBox guest additions installed. The main reason for us to have this would be to blow up the VM we are working on to full screen. 1. Open a terminal on the VM. 5. 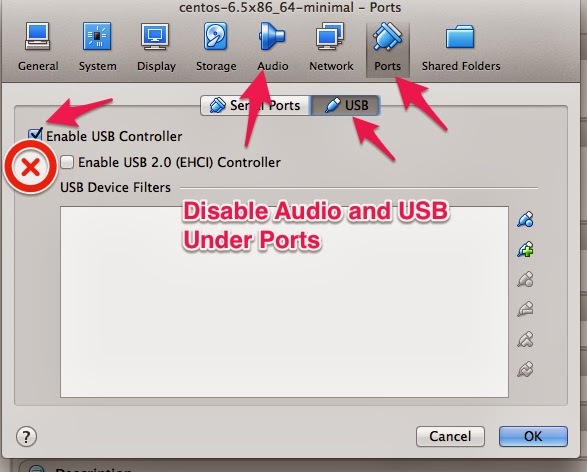 On the VirutalBox menu Click on Devices >> Install Guest Additions which is at the bottom of the menu. 6. We switch over to the CD. 7. 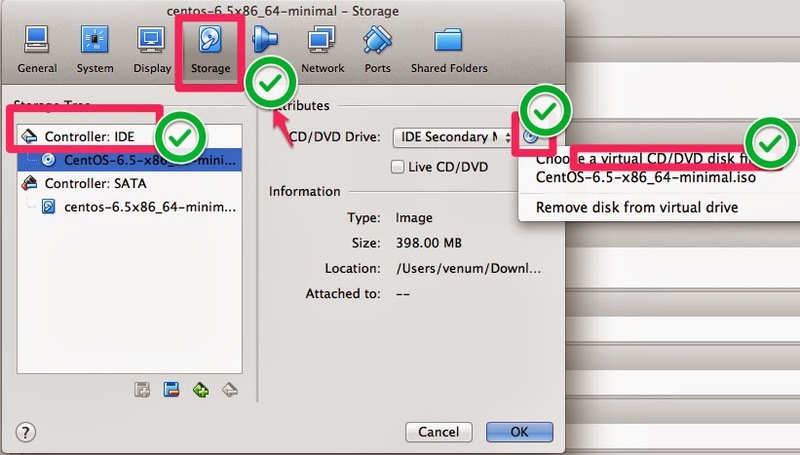 Using "ls" find the contents of the CD and swtich to it. 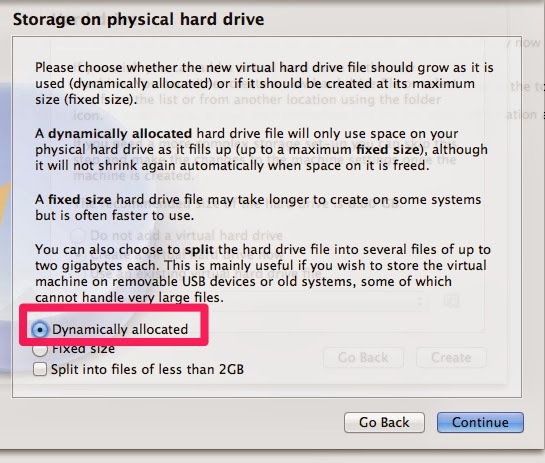 You would need to restart the VM to get these changes effective sometimes. And now we can see that on Full Screen, the VM blows up fully! There was an earlier post in which we were able to install chef in no time, but now we will dig deeper and understand what exactly happens so that we have more control over this process. Firstly we will start off by installing VirtualBox, Vagrant, Git and Ruby on a linux machine, I am using Ubuntu today to demonstrate this. 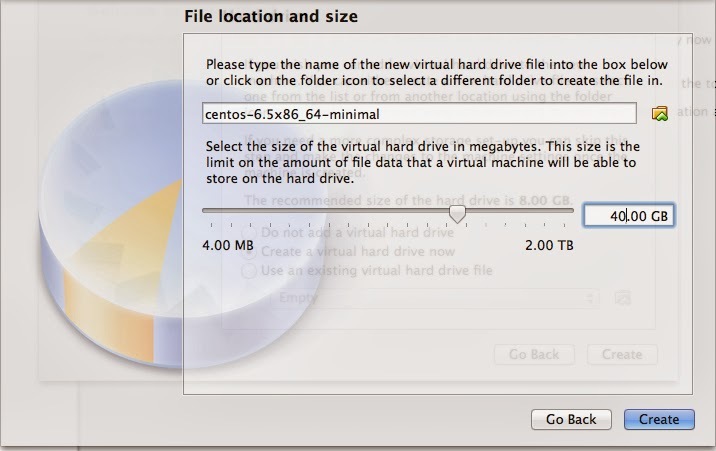 Installing VirtualBox and getting Ubuntu ready to receive it. The more detailed Version is as below, which will give us more control so that we could be as precise as possible with versions and dependencies. We go to this download page for VirtualBox to get the link for the virtualBox that we would like to have installed. 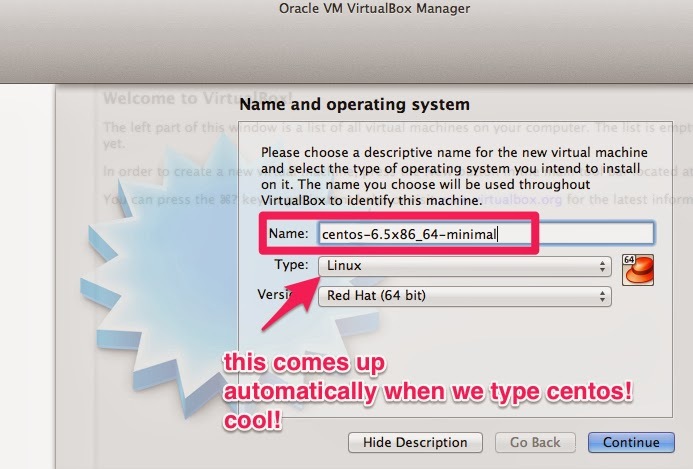 Before we run the single line command to install VirtualBox, lets just ensure that the system is upto date. 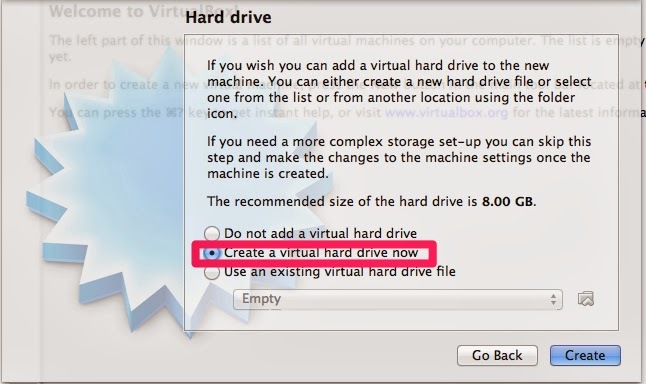 And then also Confirm that VirtualBox is not already installed and running. And then the magically formulation to have it all installed in a single command! 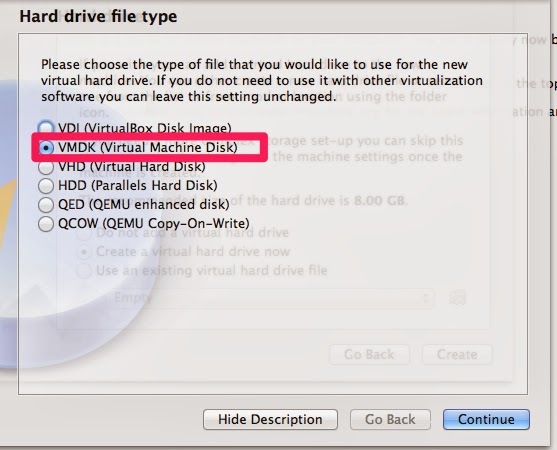 If you have some trouble installing VirtualBox in this way, running the below command should help in fixing anything that is broken. 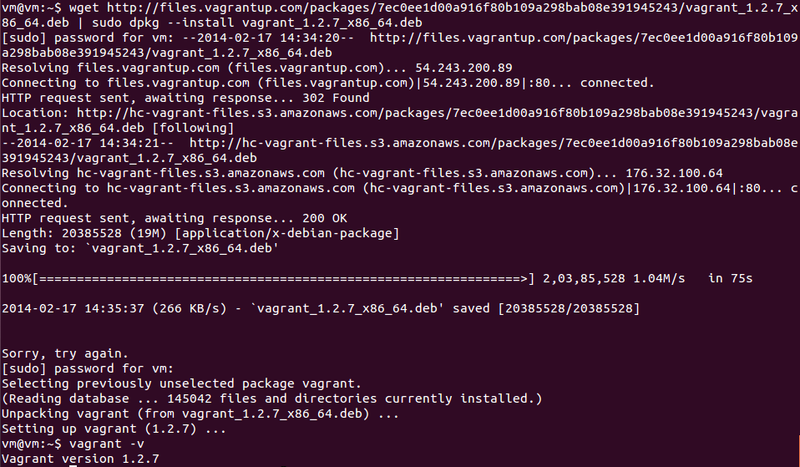 Now Installing Vagrant on Ubuntu! To get more control on this i.e. for example if I want to install the vagrant version 1.2.7_x86_64.deb while the latest one is 1.3.5 and that is what gets installed through the above command. Go to the Terminal and put in the following command, I got the link by manually going to the download page. Almost there, check if GIT is installed too ! Git is the version control we will be using. Its an awesome tool! You can check about it on this link here. the first one is to install Git and the latter is used to just confirm that Git is installed and is giving us the version number. 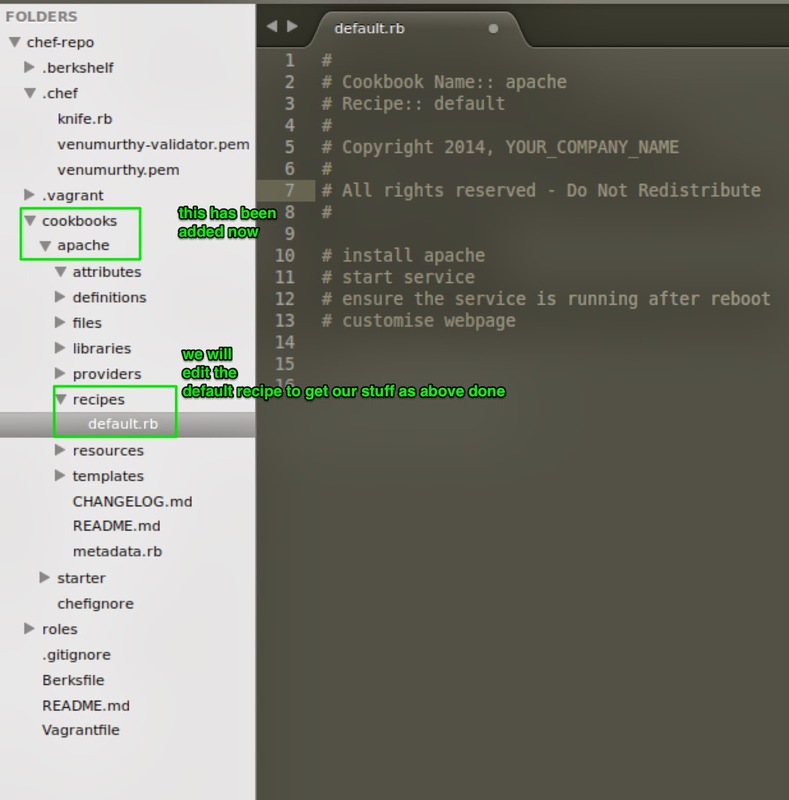 In one of my earlier posts here, we see how we can install chef in just a few seconds! But to get finer control and to know what exactly is happening, lets do it the long way here. 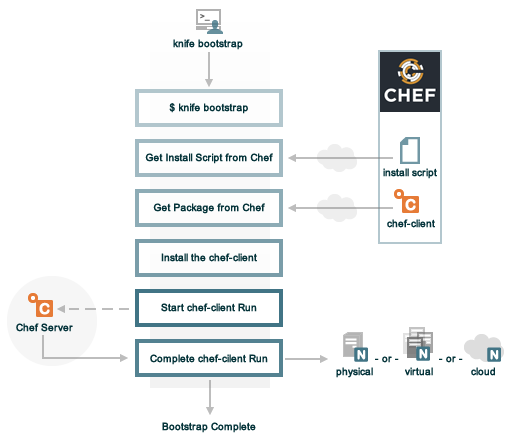 Chef is a systems and cloud infrastructure automation framework that makes it easy to deploy servers and applications to any physical, virtual, or cloud location, no matter the size of the infrastructure. Each organization is comprised of one (or more) workstations, a single server, and every node that will be configured and maintained by the chef-client. 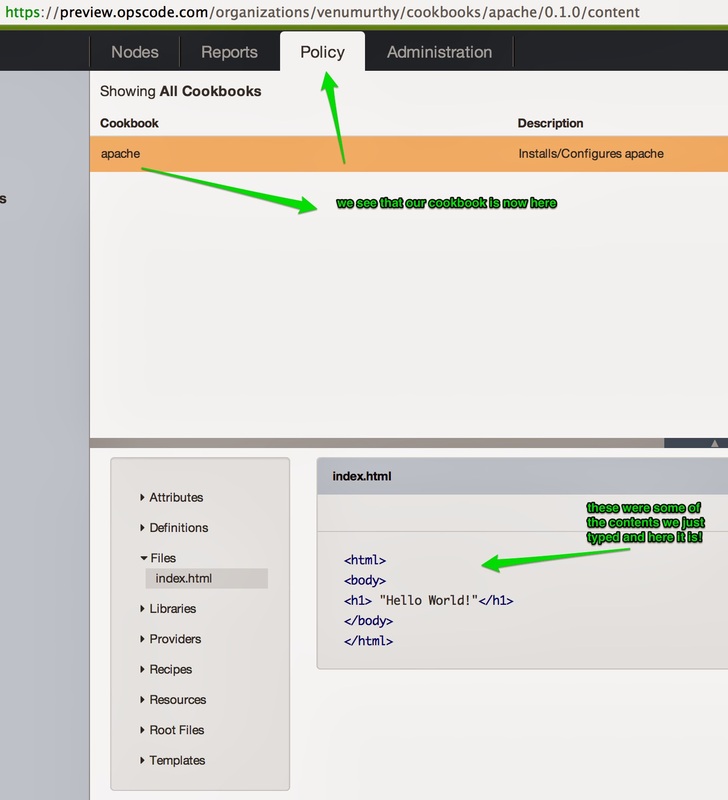 Cookbooks (and recipes) are used to tell the chef-client how each node in your organization should be configured. 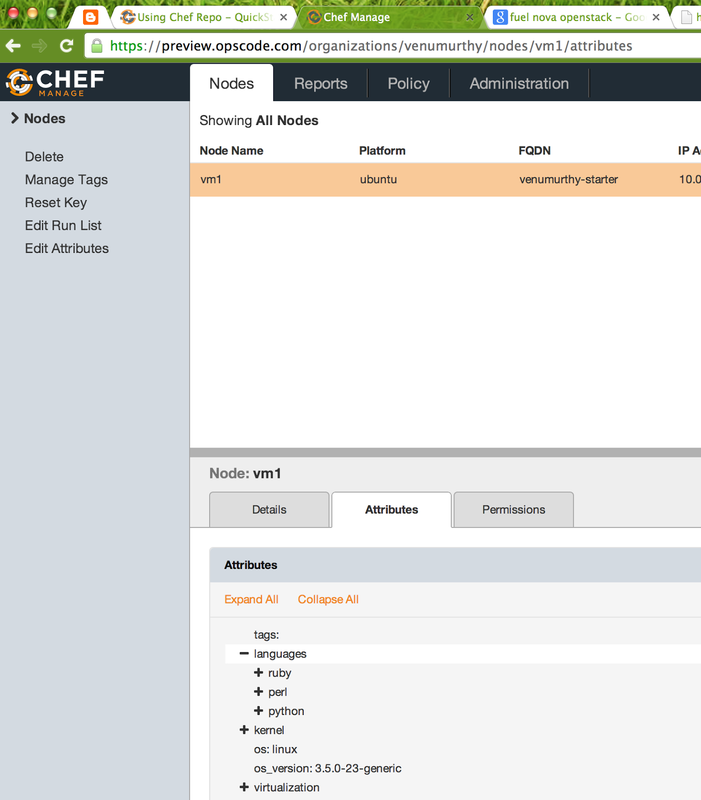 The chef-client (which is installed on every node) does the actual configuration. And it is written in a programming language called Ruby so we will now install rbenv which is the Ruby Version Manager that will provide us some virtual environments to have multiple versions of Ruby on our system and the ability to easily switch between them. Congratulate yourself for getting the chef to cook meals for you in the future! In case of error like this just do the following, (that is the reason I have included zlib the support packages that we downloaded a while ago. 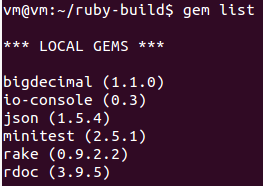 But one interesting observation is the number of Ruby gems before installing chef and after! 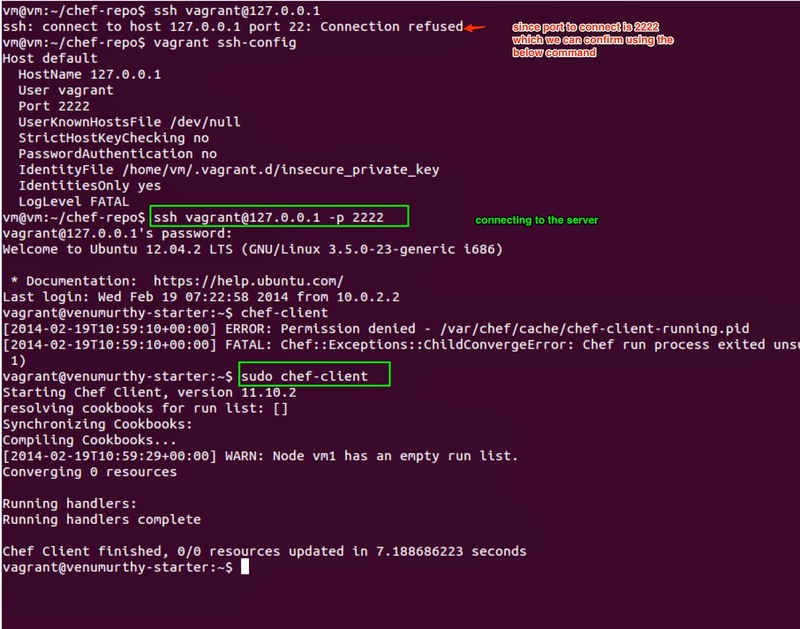 Then refer the previous post on Vagrant to have it installed. 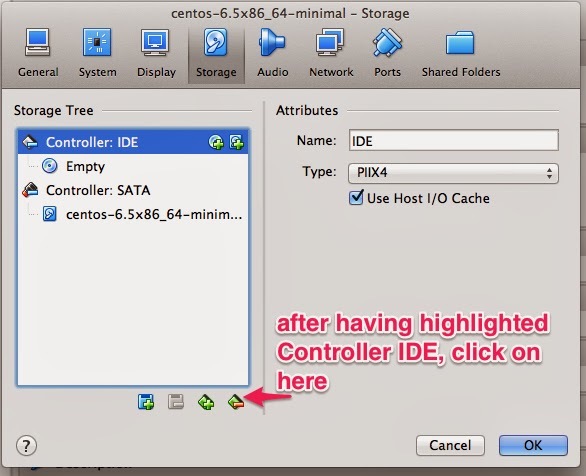 Download the CentOS 6.5 x86_64 DVD. Now installing the OS on this machine, before we do that we tell it, where to pick up the ISO file from and disable unnecessary stuff. 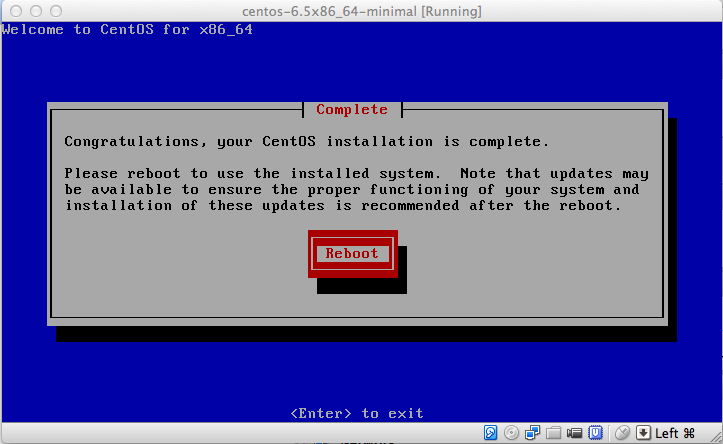 And this will load the lovely centos onto our VM! In case it reboots, just log in and shutdown the VM using "shutdown -h now" and making the VirtualBox image a little clean we do the following. 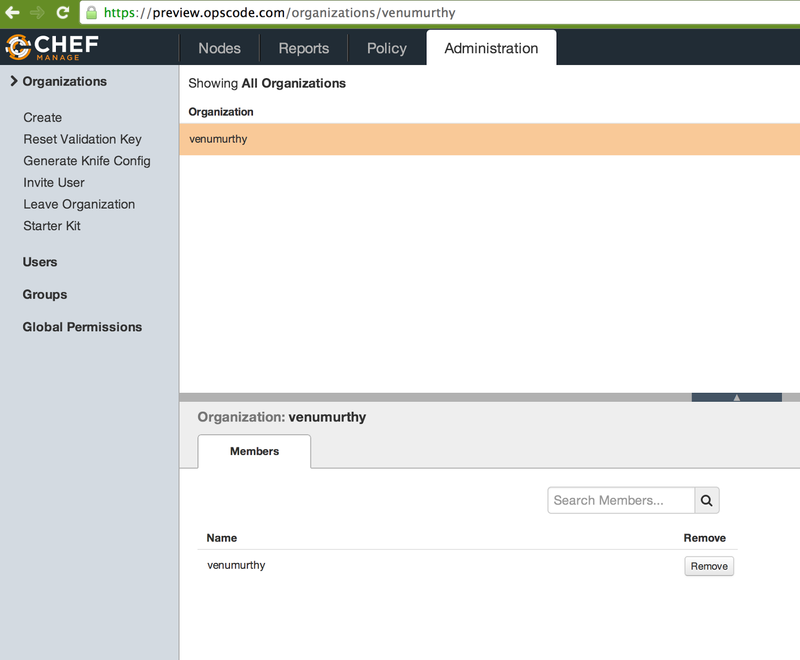 Configuring the VM to be in action when need! Configuring the network on this device. Now you should be able to get the interface listed in ifconfig and able to ping Google! Configuring Time on this machine! Now something which you shouldn't be doing if this box will be used to create prods. We will disable the iptables and make SELinux premissive due to being lazy in dealing with network services. now creating the .ssh folder for the vagrant user, the usual mkdir with -m to set the mode of the folder that is being created and -p the path. 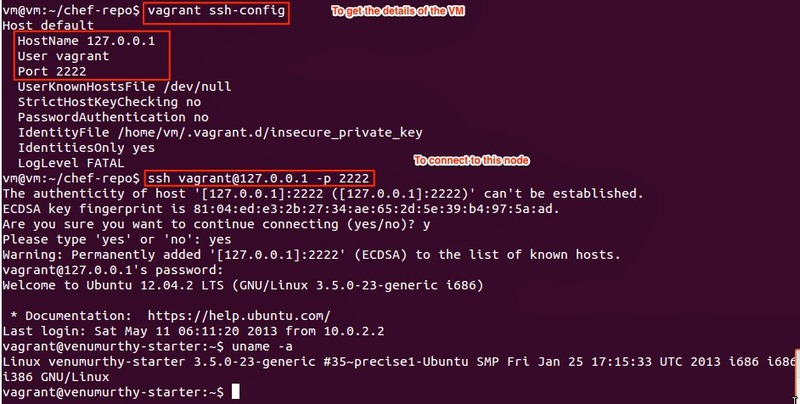 We will need to allow ssh to be able to send remote commands without using sudo and hence will comment out requiretty in /etc/sudoers. so that user vagrant will be able to use sudo without having to enter a password. Now what we have is these files, these files can themselves be distributed or kept for future use with VirtualBox, but the reason we need a box file is so that Vagrant can do it automatically and create several VMs in a matter of few minutes! Creating the Box out this now! Create a directory I've created one called vagrant_test in the home directory. <name of the Vitual box image> is the name we gave while creating the Virtual box image. This is the output we get and there is sometime delay for the new VM to get created. Out brand new baby is now available to spin any number of VM now. Taking the box file for a test ride now! To do that let us tell Vagrant that now it has box which it can use. We've finally done this, and I am going to be sharing this box with you all on a link.